The palace buildings and its grounds are one of the hidden ‘gems’ of Inner London. If you are a Londoner living in SE London or nearby, you will probably have never been there. There has been a Bishop of London ever since the office was created. St Augustine brought Christianity to Britain and, in the City of London, he founded St Paul’s Cathedral and established a bishop in AD 604. Exactly 100 years later, the Bishop of London bought the estate from the Bishop of Hereford. That began a land ownership longer than that of any other property in London - including land owned by monarchs! The Bishops of London owned the land and resided at Fulham Palace from AD 704 until 1973 when the extensive estate was given up due to financial considerations. As well as a record set for length of ownership, the property had another interesting claim to fame. It was once surrounded by the longest known moat in Britain. The water extended for about one mile in length, enclosing 36 acres of land. Sadly, between 1921 and 1924, the moat was filled in and almost no evidence for it remained visible. Its line could be seen but only by knowing where the water had once been. One point remained where evidence for the moat could be deduced and that was the location under the small brick bridge in front of the main gateway into the property. Even there, the moat was not obvious. Starting some time in 2009, it was decided to carry out an archaeological survey on 70 metres of the moat, around the land near the main gateway, and then to restore that section as a feature of the park. The work is (at the time of writing) well advanced, with the ditch now visible. While carrying out the restoration it was discovered that the moat had been filled in using building debris which has had to be removed. Some of that rubble is of interest because it contained man-made items, like old glass bottles. When the moat contained water, the level was controlled using a sluice-gate from the Thames. Most of the mechanism has been found in situ and it is hoped to put that on public display. Little is known about the reasons why the moat was built in the first place. Over the years many theories have been put forward. It is believed that the land on which the palace stood was a tiny island surrounded by very small tributaries of the River Thames. Why it was felt necessary to spend so much effort constructing such a large moat when the building it surrounded was not a castle or place of fortification may never be known. There may be little to see of the moat, other than a large muddy ditch but its restoration is important and long overdue. It could be argued that the moat should never have been destroyed in the first place. While on the subject of Fulham Palace, it should be pointed out that although the buildings stand on an ancient site, only a few of those left standing today date from any earlier times than the Tudors. Most of the building is 18th century. When the bishop left, in 1973, the property was acquired by the London Borough of Hammersmith and Fulham who did absolutely nothing with it until the late 1990s. Not only were the buildings unused but they were not properly maintained either, which meant that they steadily fell into disrepair. Since the millennium restoration has been carried out and the building is now open to the public. Unlike the superb architecture and grandeur of Lambeth Palace, which is still in use by another bishop - the Archbishop of Canterbury - Fulham Palace never had a grand interior. In fact it is surprising how plain the inside rooms are, including the unremarkable chapel. Fulham Palace, looking south. 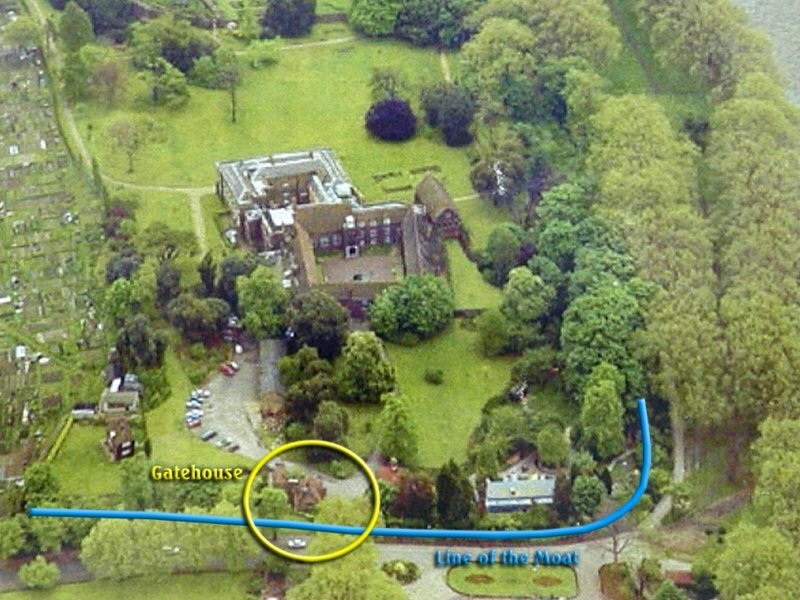 The line of the moat, passing the gatehouse, is shown. This is only a small part of the actual length. A slight dip in the land in Bishops Park indicates where tha moat ran on the river side (the right-hand side of the image) of the land of Fulham Palace. Fulham Palace shown on John Rocque's map, 1746. Here we see the land in plan. The aerial picture (above this one) looks from the NW of the map. The entrance over the moat at the NW corner of the moat is shown in the picture, with its gatehouse. Where the word 'Eights' is shown is now a large area covered by allotments. 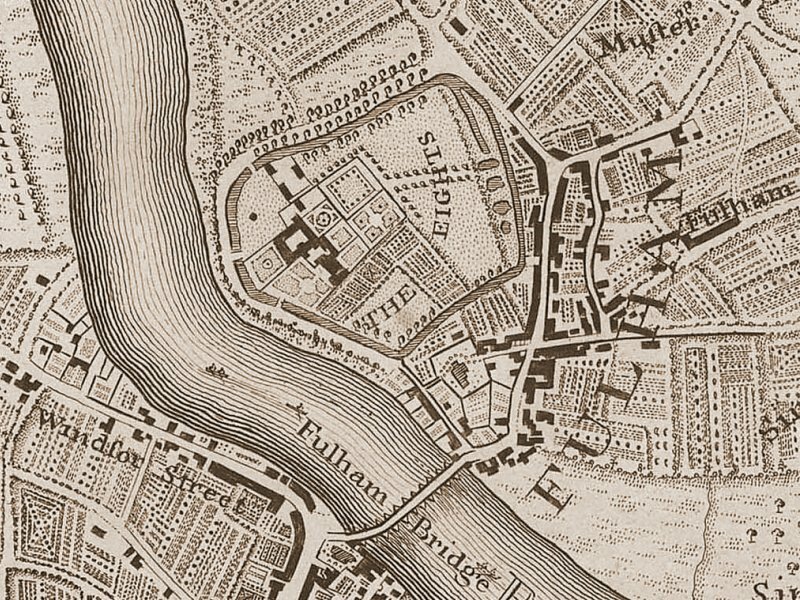 Notice how the moat towards the SE acted as a barrier, preventing the village growing north of Fulham Bridge (today known as Putney Bridge). Notice too that almost all the fields around the village of Fulham and all the land in Putney (on the south side of the river) are being used as market gardens, growing fruit and vegetables to be sold in London markets like Covent Garden.